Ransomware Lunch & Learn With Cisco! 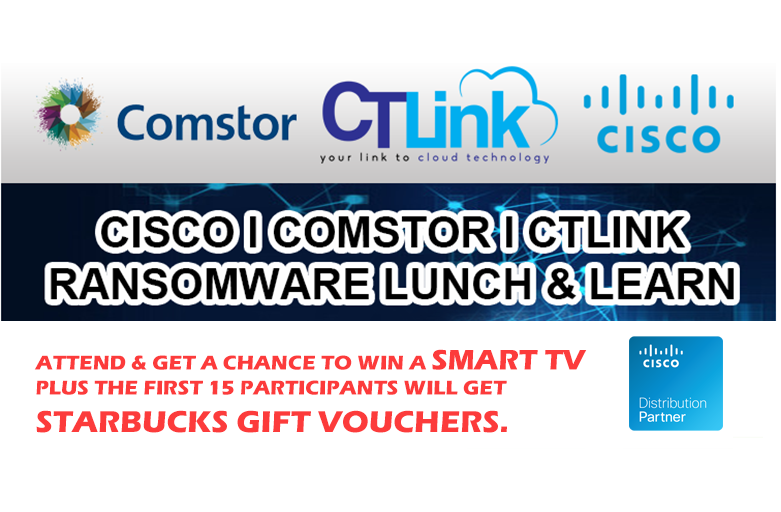 – CT Link Systems, Inc.
Ransomware Lunch & Learn With Cisco! Ransomware is becoming more prevalent now as more companies are starting to have their networks infected with these disruptive malware. With this in mind, Cisco has been improving their security portfolio to keep your IT infrastructure same from these malicious malware attacks. Learn more about it from our Cisco experts on July 17, 2018 at Discovery Primea at our Ransomware Lunch & Learn event! Get a chance to win a Smart TV and other goodies as well as you learn more about how you can stay safe from ransomware attacks. To learn more about the event or how to register for it, please contact us at 893-9515!